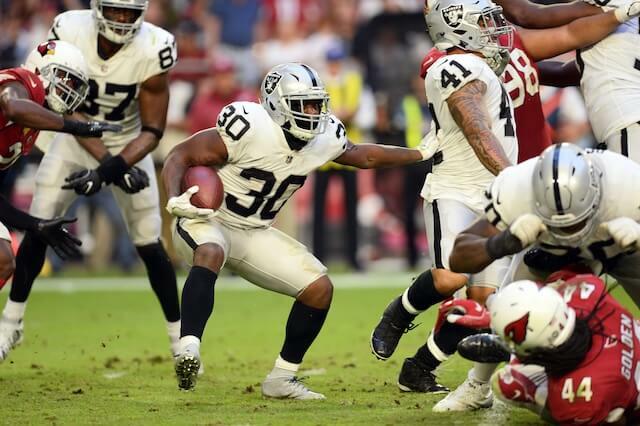 Although the Oakland Raiders have made some significant changes to their roster over the last couple of offseasons, they managed to bring back a familiar face in Jalen Richard. Richard signed a restricted free agent tender this week to keep him around for the 2019 NFL season. He is now ready to resume his role in the Raiders’ backfield. It is no secret that Oakland is in the midst of making some substantial additions to their roster this offseason. Richard is happy to be a part of it. Richard’s excitement is certainly understandable given all the changes that have been made in Oakland this offseason. He will have an opportunity to play a productive role on a Raiders team that is looking to bounce back strong next season. Richard arrived in Oakland as an undrafted free agent prior to the 2016 NFL season. The 25-year-old has largely played a complementary role in the offense since then. He is coming off perhaps his best season yet as the Raiders’ go-to back in the passing game. He finished the 2018 campaign with 68 receptions for 607 yards while tacking on 259 yards and a touchdown on 55 carries. Despite their new star-studded additions on offense, there is still plenty of speculation regarding the state of the backfield. Oakland can at least take solace in the fact that they were able to keep one of their viable options in the passing game around.